I admit that my greatest weakness as an author is marketing and promotion. It's not that I'm passive about it; I think it's because I'm not aggressive enough. I guess I'm a bit on the shy side when it comes to promoting myself. And most authors I know are the same way. Promoting others is much easier than self-promotion. I promote and market on Facebook, Twitter, Goodreads, and my personal website as well as emails, postcards, bookmarks, and other marketing plans. I occasionally go to book fairs, libraries, and bookstores to sign books and meet readers. I do some public speaking. Some strategies work better than others, some hardly work, and some don't work at all. 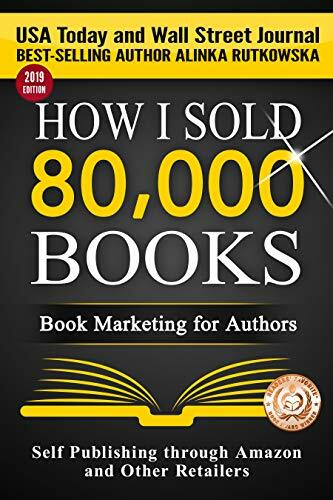 I recently finished reading Alinka Rutkowska's How I Sold 80,000 Books: Book Marketing for Authors (a free download on Amazon), and while it contains many recommendations that you see in similar books (compiling email lists, asking others for reviews, professional editing, and slick book covers, etc.) what stood out is that it takes a lot of work to promote a book. Much like writing a book. While the book targets indie and self-published authors, I've heard stories from writers with the traditional publishing houses (those behemoths in New York) that they're expected to promote their books as well. Alinka provides free advice and links to relevant websites but stresses it's the author who has to do the work. And even then, there's no guarantee that you'll sell 8, 80, 800, 8,000, or 80,000 books. And we know you're not going to sell a single book (unless to mom) if you simply sit on your hands and do nothing. Alinka's book is one I recommend (you can't beat free!). She writes in a lively and light style that 's easy to read and takes perhaps an hour or so to finish. I particularly liked the bonus section at the end which includes interviews with six authors about how they achieved their various degrees of success. So between now and the May 1 release of my next novel, New Horizons, I'll be busy promoting and marketing it to the world. I agree, marketing is very hard, and what finding out works for you is time consuming and frustrating. Those authors who post on this blog have books published by Wings ePress. The books are available at Amazon. On this blog authors want to share their experiences writing, information about their books, their short works, along with special offers. Books selected for publication by Readers like you! We're a family of authors published by Wings ePress, Inc. Our books include everything from Romance in and all of its subgenres, to Mystery, SciFi, Paranormal, Adventure, Historical, Suspense, Thriller. If you name it, we've probably written it. We're here to chat about what we love most -- writing.